More than twenty years ago, Canada and the United States pledged to restore and protect Great Lakes water quality. After years of progress—and setbacks—the two countries asked an independent agency to look at their efforts and report to the public. This week, the first report came out. The reviews are mixed, though the main message is clear: the two countries need to do more, urgently, or the lakes will decline. The First Triennial Assessment Of Progress On Great Lakes Water Quality—a report by the International Joint Commission (IJC)—finds some progress is being made. However, the report also raises concerns about health protection, sewage pollution, chemical pollution, and public engagement. The IJC said that governments are not doing enough to achieve human health protection objectives (p. 11-12). In particular, the IJC raises concerns about chronic sewage pollution problems on the lake and calls on government to set a date for ending sewage dumping on the Great Lakes. The IJC recommends that the Parties establish an accelerated and fixed period of time by which zero discharge of inadequately treated or untreated sewage into the Great Lakes will be effectively achieved and dedicate sufficient resources to accomplish the task. (p. 12). Combined sewer overflows are considered one of the “Top 25 Topics of Public Concern.” (p. 44). See section below for more on these concerns. IJC heard through the public that clean, safe drinking water should be the highest priority. They suggest “infrastructure improvements in wastewater treatment and especially combined sewer overflows are crucial, particularly in urban areas.” Consistent regulations across all states and provinces for sewage discharge are needed. (p. 45). Calls on both governments to “fund and maintain a comprehensive and well-designed binational water quality monitoring program” as the data can be used to “understand the linkages between storm events, agricultural and urban runoff, combined sewer overflows, and harmful algal blooms in order to develop effective prevention and mitigation strategies.” (p. 64). IJC points out that there needs to be more connection “between recreational waters and the need to address sewer overflows.” (p. 79). “In one year, 20 Great Lakes cities in the US and Canada “released a combined total of 92 billion gallons [348 billion litres] of untreated sewage and stormwater to the Great Lakes mostly via CSOs.” (p. 139). “Sewage overflows must be addressed to reduce the risk of human illness from Great Lakes waters. In this 21st century, after more than 100 years of water treatment, the public can no longer be asked to tolerate the dumping of raw sewage into the Great Lakes except under extremely rare conditions.” (p. 159). The top three public concerns about the Great Lakes were swimmability, drinkability, and fishability. 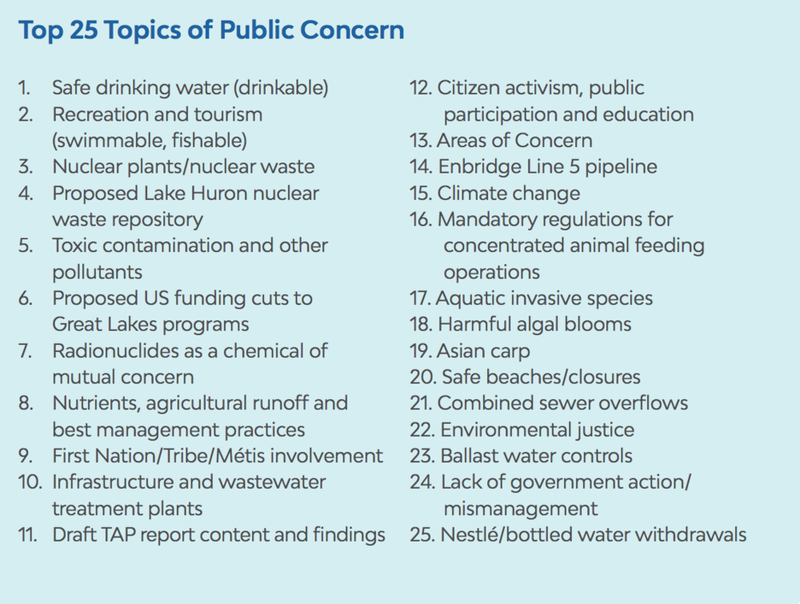 Beach closures were also included in the public’s top 25 concerns about the Great Lakes (p. 44). See below for the list of 25 concerns from the report. Highlights of the report can be viewed here. Rules upon applications for approval of projects affecting boundary or transboundary waters and may regulate the operation of these projects. Assist the two countries in the protection of the transboundary environment, including the implementation of the Great Lakes Water Quality Agreement, and the improvement of transboundary air quality. Alert the governments to emerging issues along the boundary that may give rise to bilateral disputes.